Comic books are a unique and increasingly popular form of entertainment combining visual and textual elements of communication. This work pertains to making comic books more accessible. 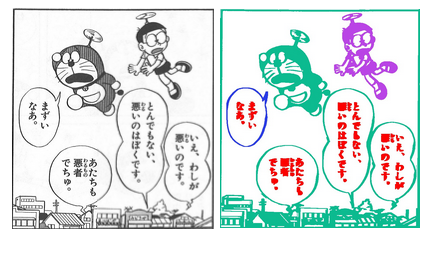 Specifically, this paper explains how we detect elements such as speech bubbles present in Japanese comic book panels. Some applications of the work presented in this paper are automatic detection of text and its transformation into audio or into other languages. Automatic detection of elements can also allow reasoning and analysis at a deeper semantic level than what’s possible today.